Antonio Manuel da Silva Oliveira (Avelãs de Caminho, Portugal, 1947) is considered one of Brazil’s most prominent artists. Along with figures such as Hélio Oiticica and Cildo Meireles, Antonio Manuel formed part of the neo-avant-garde movement that emerged in Rio de Janeiro during the second half of the twentieth century. Like many of his contemporaries, he developed a highly experimental oeuvre that challenged the limits of traditional art practice. 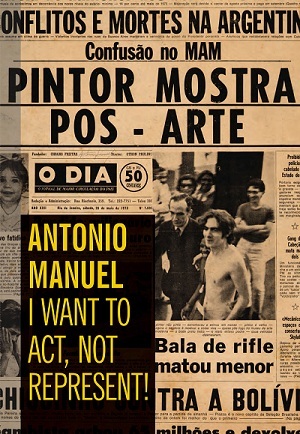 Edited by the Americas Society and Associação para o Patronato Contemporâneo, Antonio Manuel: I Want to Act, Not Represent! is produced in conjunction with the eponymous exhibition— the artist’s first solo show in the United States—held at Americas Society’s Art Gallery. The publication features reproductions of Antonio Manuel’s artwork from the 1960s and 70s, in which he manipulates images appropriated from the mass media, explores performance and video art techniques, and reinterprets the human body itself as a vehicle for art. Also incorporated in the catalogue are four scholarly essays that seek to analyze and contextualize the artistic production of Antonio Manuel within the climate of political repression in Brazil of the 1960s and 70s as well as the larger theoretical discourse surrounding conceptual and body art as international phenomena. In addition to essays by Michael Asbury, Claudia Calirman, Gabriela Rangel, and Judith Rodenbeck, Antonio Manuel: I Want to Act, Not Represent! also includes an interview with the artist conducted by Beverly Adams and a text by the artist exploring his serial work Urnas quentes (Hot Ballot Boxes). Finally, the publication contains a facsimile reproduction of A arma fálica (A Phallic Weapon), Antonio Manuel’s fotonovela starring Hélio Oiticica, Tineca, and Paulo, with texts written in collaboration with Lygia Pape, photographs by Kiko (Marcos Lins Andrade) and graphic design by Luciano Figueiredo.